Just Marketing! 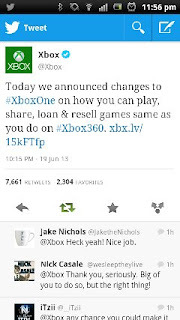 : Well played microsoft, But did you do this on purpose? Well played microsoft, But did you do this on purpose? The massive computer giants seriously messed up again, yes can you believe it? Just like Sony did with the release of their PS3, their main competitors, Microsoft, messed up big time with the initial announcement of their new 8th generation console the Xbox One. Being a massive Xbox fan boy myself, I couldn't wait to see/hear about the next Xbox console, about how they were going to improve my gaming experience and "take my money" in a sense... but I don't think many predicted what Xbox had in store for us! First of all, one of the most simplest most popular things people do with games cut out of the picture, borrowing games. 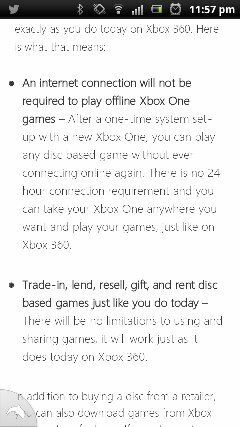 Yes, borrowing games, no pre-owned Xbox One games, no borrowing to friends and family, SERIOUSLY MICROSOFT? Personally I'm not a massive fan of the "selling your old games" malarkey because of the simple fact that when at uni, with a lot of time on my hands, I'll pick out an old Xbox game to spend hours of time on, whether it be a game released last month or last year, but Microsoft's "In-genius" plan to take trading games out of the equation is just stupid! Now some witty employees at Sony saw this opportunity after the announcement of the ridiculous feature from Microsoft and create a humorous mockery of their rivals at Microsoft, which became a very successful viral ad (13,246,760 views as off 23/06/2013) this can be seen below, so check it out! The second mistake that Microsoft made with their next gen console was the online checking function, meaning that you would have to be connected to Xbox live on your new Xbox One console every 24 hours... so what your saying Microsoft is that if I don't fancy playing my Xbox everyday something might happen to my live, seriously Microsoft what are you playing at? But really...were you playing at that? Did you actually plan to make these features set, or was it a marketing ploy? Microsoft decided not too include these features that were a talking point on twitter as well as across the rest of the world wide web. Looking through the internet I see lots and lots of people blogging and writing about how "Microsoft have listened to their users" and how they've "came to their senses" ... but I really don't think that, not at all. Personally, and this is a very personal opinion which could just be some sort of delusionally piece of rubbish poster on just another blog, but I think the whole thing was a clever marketing and PR ploy put together by the guys at Microsoft. Who was talking about the PS4 for the few weeks after the announcement of the Xbox One and its features? Apart from the odd few saying " oh I'm getting a PS4 now" because of how obserd Microsoft had been with their new console, not many, not many people at all. But when Microsoft decided to say on twitter and on their site "We've listened to your opinions and acted" they've created them selves a lot of publicity, an image of "listening to what their loyal customers want" and "creating what's best for the customer". So, if my theory is correct, Microsoft announced on their twitter and their website showing their acknowledgement for their customers wants of "removing" the features of the new console, but didn't plan too even include those features. BUT don't take this as a fact, just my opinion, and I guess a strong opinion at that. So if im right, did they pull it off? It's hard to tell really, a lot of my close friends decided then and their that they were to get a PS4 because of the outragous plans from Microsoft, but when the changes were anounced, it got them thinking. Yes the pricing of the Xbox One is still a lot more than the Sony Playstation ( I think around £100 more), but from my personal experiences, Xbox live as a feature, the gaming community, the controller (its seriously so much better) and every other part of the Xbox are just so much better than the PS4! 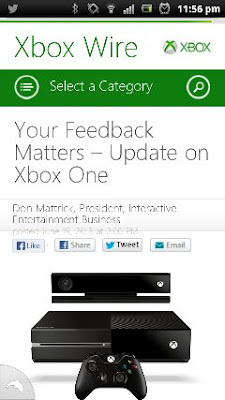 Xbox Website, showing how "Your Feedback Matters"
A certain lack of marketing blogs? BARR's IRN BRU , "FANNY"